Park Lane W1 runs along the eastern side of Hyde Park, stretching north from Hyde Park Corner to Marble Arch. 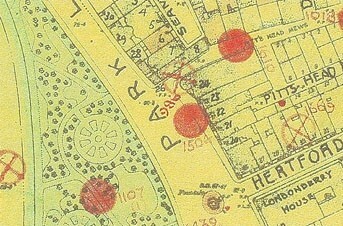 During the 1920s, hotels and apartment blocks sprang up on Park Lane, replacing the large Mayfair mansions and grand houses that previously stood there. 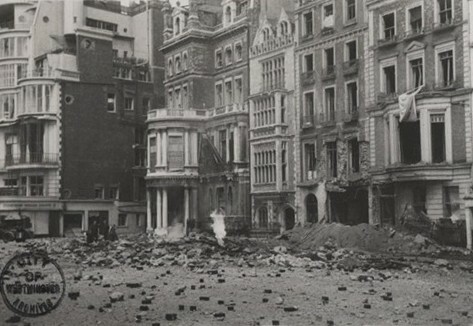 Around 2.15am on 11 May 1941, a high explosive bomb fell directly opposite Nos 20-24 Park Lane. Major damage was caused to No 22 and a large crater and burning coal gas main in the roadway were noted by City of Westminster ARP. No casualties were reported but the Water Board was later called to deal with a burst water main. 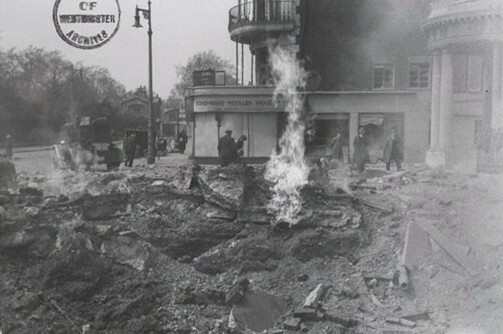 In 1960 the site was cleared and redeveloped to make way for the Hilton Hotel, Park Lane. Located nearby are the Art Deco Dorchester Hotel, private residences and the Animals in War Memorial (2004), the latter commemorating all animals that served Britain in her 20th century wars. This page was added by Tabatha Parker on 05/04/2011.